If you’ve seen my previous reviews, like October and September, you’ll know I’m really into this subscription service! But, this month really takes the cake. It’s as if they were reading my mind or copied my shopping list! 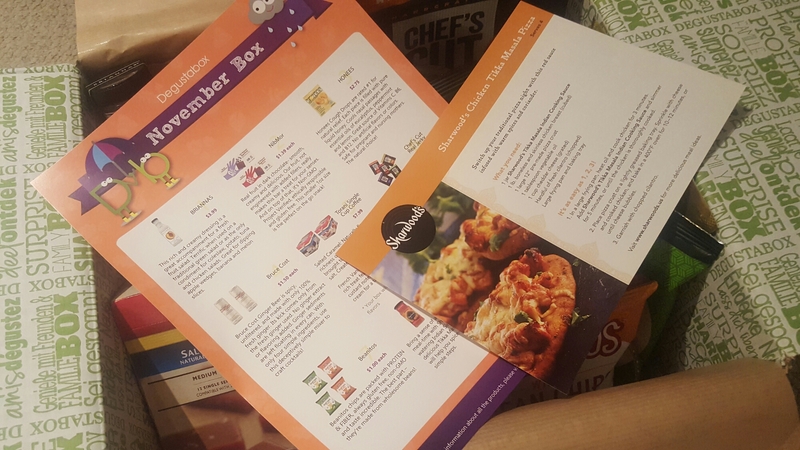 Read on to see all the delicious goodies included in my November Degustabox! The box was packed to the brim, with an information sheet on top, plus some awesome recipe cards! Tikka Masala is one of my favorite Indian dishes of all time, but there are not a lot of Indian restaurants near me, so I was beyond happy to see this Sharwood’s Tikka Masala Sauce. You can follow one of the recipes on the above cards, or use on your own! Personally, I’m thinking of making Chicken Tikka Masala with rice or Chicken Tikka Masala pizza using naan bread! Balsamic glazes is seriously the best thing ever; if you havn’t tried it, buy a bottle asap! This summer, I purchased a bottle from my farmers market and just recently ran out, so I was happy to see this Ponti Glaze with Balsamic Vinegar of Modena. You can drizzle it over tomato and mozzarella, use to make a salad dressing, glaze grilled chicken, etc, the options are endless! 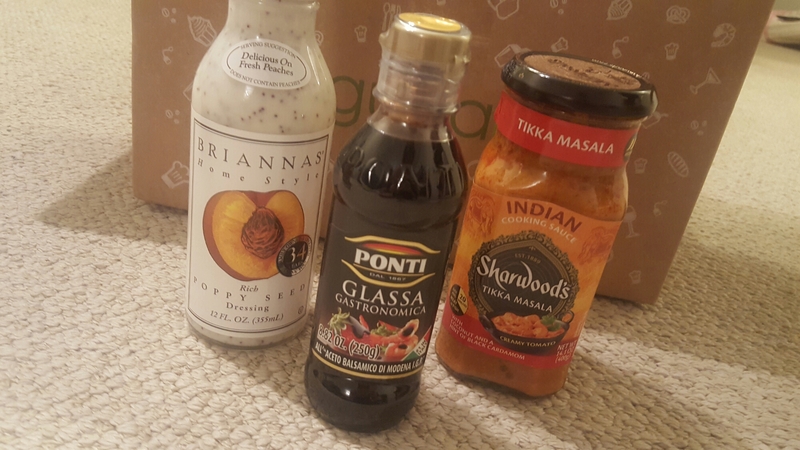 One of my favorite salad dressings, Briannas Poppy Seed Dressing was included in this box as well! Personally, I love it on mixed greens with beets, crumbled cheese, walnuts, craisins and grilled or breaded chicken. I love a good Moscow Mule, and so this Bruce Cost Ginger Beer couldn’t have been better! It’s smooth, with a bit of a kick, and perfect for making a mixed drink; just add ice, vodka, muddled cucumbers and lime, and you’re all set! 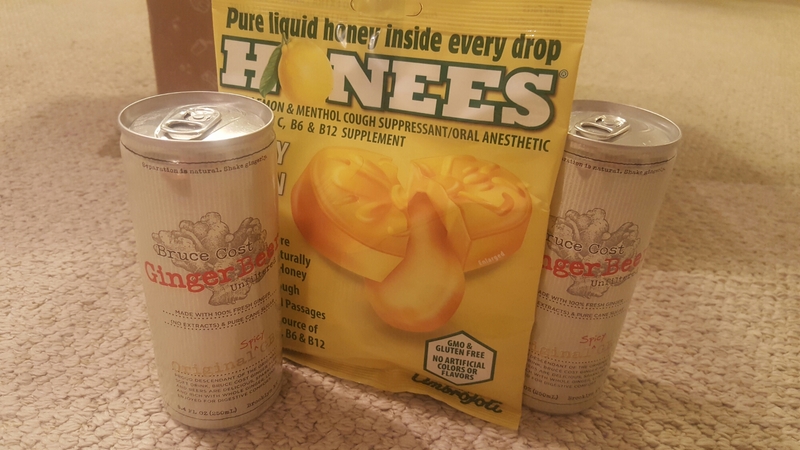 These Honees Honey Lemon Drops are the best tasting cough drop I’ve had lately. They have a sweet, soothing flavor, and have real gooey honey in the middle. Perfect for a sore throat or cold winter day! These Nib Mor All Natural Superfruit in Blueberry and Cherry dark chocolate bars were really cute and tasted great. While there were no bits of fruit, I could taste the different flavors in each bar. 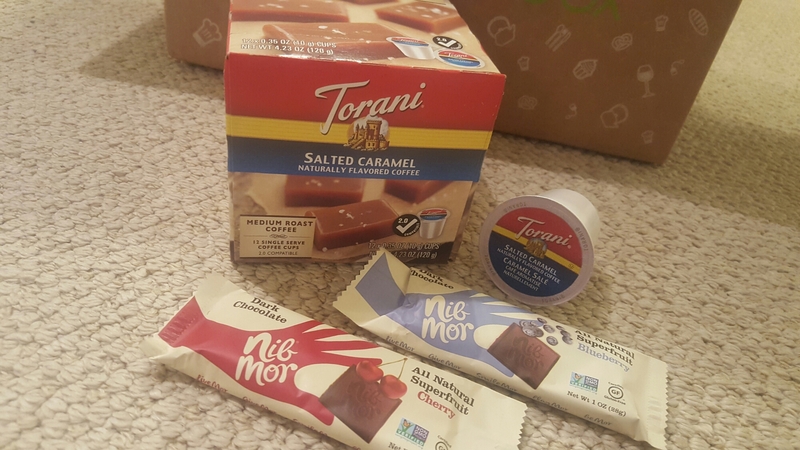 The Torani Salted Caramel Coffee Keurig Pods were a great addition as well! I have a Keurig at work and love caramel and coffee, so once I brew it up and add some vanilla soy milk, I will be one happy girl. 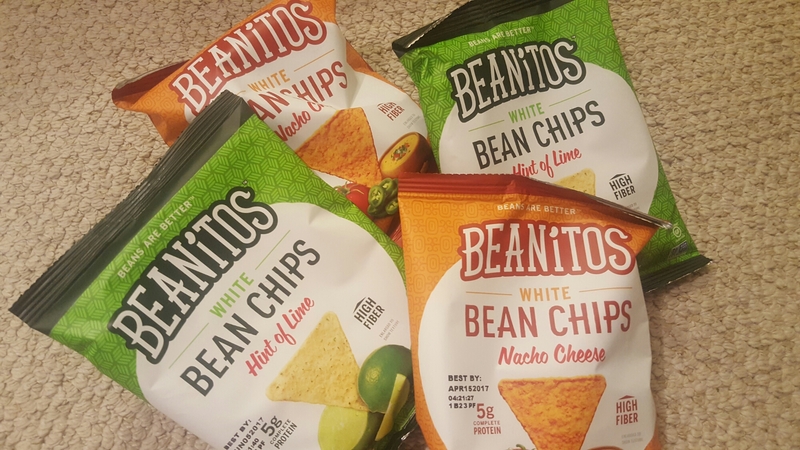 This box was all about Beanitos White Bean Chips! There were 4 little baggies of these snacks, along with a coupon for a full-size bag. The varieties included Hint of Lime and Nacho Cheese, both which were tasty. The Hint of Lime are compariable to a Tostitos Lime chip, whereas the Nacho Cheese was similar to Doritos. You can eat them as is, or dip into salsas, bean dips or cheese dips. I’m a huge fan of jerky, whether its beef, pork, steak, venison, etc.. so this Chef’s Cut Real Steak Jerky Chipotle Cracked Pepper was a great item to receive. The spicy, pepper flavor had a nice kick to it, and it was a good combination of chewy and dried. This cute small package of Oloves Basil and Garlic Natural Green Pitted Olives were tasty and great for bringing to work. While I usually don’t just eat olives as is, I could see them being useful for someone who wants a savory, unique snack. All in all, this has been my FAVORITE Degustabox yet! From the superfruit chocolates and the sour gummy bears to the beef jerky and craft ginger beer, I absolutely loved all of the items in the November Degustabox. Interested in your own? 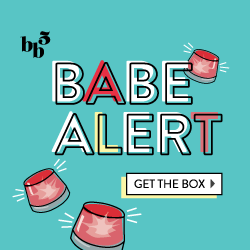 Click here to sign up to get next months box!